The sight of these giant silver proteas against the mountain must be one of nature's finest and is one to treasure. These beautiful trees, with their light-reflecting, silky, silver leaves grow in dense stands on the slopes above Kirstenbosch and are unique to the Cape Peninsula, but this species is in danger of going extinct in the wild in the next 50 years if we don't take care of the remaining wild populations. Leucadendron argenteum is an erect, well-proportioned, ornamental tree, 7 - 10 m tall, with a stout trunk and thick, grey bark. The upright branches are covered with large lance-shaped leaves, up to 150 x 20 mm, which overlap each other up the stem, concealing the thick branches. The leaves are silver-grey, covered on both surfaces with thousands of tiny, soft, silvery hairs and fringed with long white hairs. The characteristic silver sheen of the leaves is caused by the hairs. The intensity of the sheen varies with the weather. They are at their most silver in hot, dry weather, when the hairs lie flat to protect the leaves from drying out. In wet weather they are not quite as dazzling, as the hairs stand more erect to allow for free air circulation. Like all leucadendrons, it is dioecious, meaning that the male and female flowers are borne on separate plants. The flowers are in dense heads at the branch tips. The leaves that surround the flower heads, known as the involucral leaves, do not change colour while the tree is in flower, but they open wider, thus catching the light at a different angle and shining brighter silver than the rest of the leaves. The male trees are more showy, they flower more prolifically, the involucral bracts shine bright silver and the flower heads are bright yellow balls that seem to glow inside the silver leaves. Female flower heads are quite hard to find as the involucral leaves conceal the heads and don't shine quite as brightly. Also, the female flower heads tend to be higher up on the tree and are not easy to spot from below. Both the male and female flower heads have a faint, pleasant scent. Flowering time is spring (Sept.-Oct.). 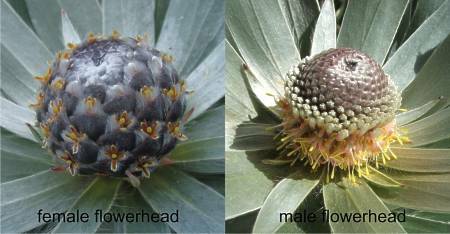 The male florets are in rounded heads, 40 x 50 mm wide, the florets are silver to pinkish silver in bud and yellow and pink when open. The female florets are in globose (near spherical) cones 50 mm long and 40 mm. The female cones are formed by overlapping bracts, known as floral bracts, which are silver with a pink tinge. The small yellow-orange flowers are fringed with long, white hairs, and are partially hidden behind the floral bracts so that only the tips can be seen. After pollination, the seeds take several months to develop, during which time the female cone enlarges to become an ovoid (egg-shaped) cone, 90 x 60 mm wide, silver and densely covered in hairs. On the maturing cone, a bit of the fringe of white hairs and the dried remains of the flowers can still be seen sticking out above the floral bracts. The fruits remain in the cone and on the tree until it dies, although a small percentage of the cones open and release their seeds in hot, dry weather. The easiest way to tell a female from a male tree is to look for the previous year's cones on the older wood of the female. You will see the previous year's cones, still silver, below the current season's growth, and older brown woody cones still further back. The male flower heads dry to form small silver balls and fall off after flowering. The seed is a large nut (10 x 8.5 x 5.5 mm). Each seed is equipped with a plumed parachute-like appendage, which aids in dispersal of the seed. This plumed parachute is the dried remains of the flower, still attached to the seed. Leucadendron argenteum is fast-growing but relatively short-lived, rarely living longer than 20 years. Rare and endangered. Rare means that it has a small population and a restricted distribution range, which puts it at risk from sudden or unexpected changes. Endangered means that it faces a very high risk of extinction in the wild. It is estimated that Leucadendron argenteum has lost 74% of its population and 55% of its habitat has been transformed primarily by urbanization and agriculture. Silver trees thrive on the forest margin where fires are infrequent, but it is also thought that the fire-exclusion management of land that contains natural populations has caused these populations to become moribund with mostly older trees and few saplings and overall fewer individuals over time. For example, in the Kirstenbosch population, 6850 plants were counted in the late 1970s, soon after the area was cleared of gum and wattle, but in 2005, only 1000 plants were counted. Another factor is the way its habitat has become fragmented by pine and gum plantations and urban sprawl. If the rate of population reduction and habitat loss continues then this species will be Critically Endangered by 2025, i.e. face an extremely high risk of extinction in the wild, and could be Extinct in the Wild by 2050. Nevertheless, many of the populations fall in protected areas or are being carefully managed and monitored, and as long as they remain protected, it is unlikely that this will happen. The silver tree was of great importance for firewood on the Cape Peninsula in the 17th and 18th centuries, during which time it was extensively planted and harvested for firewood. Today it is a protected species. The threats that Leucadendron argenteum faces today are urbanization, timber plantations, the transformation of its habitat from fynbos to forest due to fire exclusion, fragmentation of the remaining populations, invasion of its habitat by alien plants, predation of its seed bank by alien squirrels, too-frequent fires, and the root rot fungus Phytophthora. Leucadendron argenteum occurs on cool, eastern and southerly slopes on granite-derived clay soils, at 100-150 m, and trees are conspicuous on the slopes above Kirstenbosch. There are eight populations spread over an 11 km range with a few outliers in Somerset West, Paarl and Stellenbosch. Only the populations at Rhodes Memorial and Tafelberg Road grow on shale-derived soil. Historical records indicate that Leucadendron argenteum once grew from Lion's Head, across the lower northern slopes and along the eastern foothills of Table Mountain, and one report says all the way the way to Muizenberg, but this is not entirely believed as the most southerly known population is Vlakkenberg and the Muizenberg slopes are thought to be too hot for the silver tree. The largest populations are at Kirstenbosch, Wynberg Hill and Lion's Head. More than half of the wild trees grow in the Kirstenbosch population. Because this species was extensively planted in the days when it was used for firewood, there is a strong possibility that the outlier populations off the Peninsula are not natural but were planted in the 1700s and 1800s and naturalized. It is also possible that the populations on the northern side of Table Mountain are not natural but planted. Some go so far as to say that only the Kirstenbosch and eastern slopes of Table Mountain populations are natural. The name Leucadendron is from the Greek, leukos, meaning white, and dendron, tree. This genus is named after and based on the silver tree, from its common name witteboom, meaning white tree, as it was known in the 1690s when the genus was first named. The species name argenteum is Latin and means silver, silvery or ornamented with silver, referring to its striking silver foliage. The silver tree has long attracted the attention of travellers, plant collectors, botanists and gardeners. The first record of the tree was in 1620 when Augustin de Beaulieu described it when he visited the Cape. Hendrik Claudius was at the Cape from 1682 to ± 1687 and collected and illustrated many botanical specimens from the Cape Peninsula, including this species, calling it 'Pinus Africana, sive Witteboom' (African pine or witteboom). These illustrations were published in the Codex Witsenii in 1692. Both Burman and Boerhaave published engravings of some of Claudius' drawings. Paul Hermann visited the Cape while en route to India in 1672 and collected a number of specimens. One of them was a twig and fruit of Leucadendron argenteum which was illustrated in Plukenet's Phytographia in 1692, plate 200, fig.1, and named 'Leucadendros Africana, arbor tota argentea, sericea foliis integris.' (white tree from Africa, the whole tree silver, silky leaves entire). In 1693, Sir Hans Sloane described and illustrated it as 'The Silver Pine-Tree' in the Philosophical Transactions of the Royal Society, from material brought from the Cape by Mr Goddard. In 1701, Commelin published a drawing of a young Leucadendron argenteum specimen cultivated at the Medical Garden in Amsterdam and a mature cone and a fruit brought from the Cape. He called it 'Argyrodendros Africana' (silver tree from Africa ), and also recorded the name Witte Boom at the same time. Kolbe first recorded the name silverboom in 1705-1713, but the name was in use long before then. It was described and named many more times, acquiring a confusing collection of names over the years. In 1737, Linnaeus in Hortus Clifortianus described this species from material in Clifford's herbarium placing it in the genus Protea, and praising it as 'the most shining and splendid of all plants'. In his Mantissa in 1771 he used this species as the basis for his definition of the genus Protea, calling it Protea argentea. It was Salisbury and Brown that brought order to the family in 1807 and 1810, dividing it into the genera that we recognize today. Brown conserved the name and redefined the genus Leucadendron and based it on L. argenteum. It has inspired a few place names over the years, the earliest recorded being Witteboomen in 1672, a thicket on the way to Hout Bay. Wittebome Station in Wynberg reminds us of the days when Wynberg was a village surrounded by large groves of the silver tree. Farms on the Peninsula called Witteboom or Silverhurst were named for this tree. The genus Leucadendron belongs in the protea family. It consists of 83 species, most of which occur in the Western and Eastern Cape with a few outliers in KwaZulu-Natal. They are all dioecious shrubs or trees, and are known as conebushes because the female flower heads form woody cones in which the fruits are borne. The flower heads have a faint, pleasant scent, which attracts the small beetles that do the job of pollination. To survive in the fire-prone fynbos, Leucadendron argenteum has evolved the reseeding strategy. Despite its thick bark, adult trees are usually killed by fire and only the seeds survive. The seeds are kept safe in the large woody cones on the plant and are released en masse after a fire. A small percentage of the seeds are released during the lifetime of the tree, which keeps the population healthy by producing a steady supply of young plants in the absence of fire. Seeds are dispersed by wind. Although the seeds are large, relatively heavy nuts, they are equipped with a plumed parachute-like appendage, the dried remains of the flower, which carries it a considerable distance from its parent plant. The seeds are also eaten by rodents, which collect and store the seeds in underground caches where many remain uneaten, and viable for many decades. Seeds have been known to survive in the soil for 80 years. The alien grey squirrels also eat the seeds, taking them from cones as they are opening. A typical feature of a population of silver trees is the occasional dead plant in amongst the living. Some die of old age but often death of younger plants is caused by the root rot fungus Phytophthora. Leucadendron argenteum is very susceptible to this fungus, and it causes the death of 1-5% of wild populations every year. The fungus invades the root system, entering where they have been damaged or broken, and impairs the tree's ability to take up water. Infected trees appear to die very suddenly. An infected tree can cope when the weather is cool and wet and appears to be healthy, but on the first hot, dry days in spring, or if the hot and drying berg winds blow, the damaged roots cannot get enough water to the leaves, and they wilt and die, sometimes within hours. Wild plants are also attacked by a beetle, the Silver Tree Borer, also known as the Protea Jewel Beetle, Sphenoptera sinuosa, which bores tunnels in the roots and increases the chances of Phytopthora infection. Leucadendron argenteum is widely cultivated as an ornamental garden specimen. Its beautiful silver foliage is used in floristry and lasts well in the vase. The leaves have also long been collected, pressed and dried for decoration or as a souvenir. The dried female cones are decorative and the small silver balls of the dried male flower heads are used in dried floral arts and crafts, e.g. to make the body of mice or hedgehogs. In the 1600s and 1700s. L. argenteum was extensively used as firewood. The silver tree has the reputation of being difficult in cultivation, mainly because it is very susceptible to the root rot fungus Phytophthora and like most members of the protea family dislikes soggy soils, still, humid air and strong fertilizers. But, they are actually quite easy to grow if they are treated correctly and have been known to thrive far from their natural home. In nature, silver trees grow on cool, east-facing slopes in soil derived from weathered granite that has a high moisture content but is free-draining. In cultivation they tolerate most conditions and grow well in several soil types, but the soil must be well-drained. They need a sunny position, with good air circulation, well-drained (sandy) soil, plenty of water, particularly in autumn-winter-spring and protection from frost. They do well in moderately fertile soil, but may be burned by heavy manure or strong doses of chemical fertilizer. They do best with well-rotted compost, low-dose or slow-release fertilizer and the soil around their base and inside their drip line should be left undisturbed particularly in areas where Phytophthora is known to occur. A small grove of Leucadendron argenteum is a wonderful feature in the landscape, and looks particularly good when the sun is behind them, giving them a shimmering, silver glow. A single specimen is also very striking. Being a small tree, it is a good choice for today's smaller gardens. The silver tree is quick-growing, reaching 8 m in 10 years, but short-lived, rarely living beyond 20 years. To maintain a small grove. it is best to plant a number of young trees every few years. Before planting, clear the site of weeds and dig in well-matured compost. Dig individual holes large enough for the root ball of each plant. Plant them about 1 m apart. During the first two years the plants must be watered regularly. By mulching with compost or wood chips to a depth of 50 mm, weed development is kept to a minimum. It is important not to dig around the base of a tree, or inside the drip line to avoid damaging the roots, as the root-rot fungus infects the plant via broken or damaged roots. Other advantages of mulching are that the soil is kept moist, soil temperatures are kept down and the plant receives nutrients as it decomposes. Trees can be propagated from seeds or cuttings. The best time to sow seed is in autumn, the start of the rainy season in the Cape. Sow fresh seeds in open seedbeds or trays filled with a well-drained medium and place in a sunny position. Broadcast the seed evenly, firm down and cover with clean sand or milled bark to the depth of approximately 10 mm. Keep the soil moist. Germination takes about 3 to 6 weeks. Seedlings are ready to transplant into individual containers when the first pair of true leaves appear. Use a medium with good drainage, water thoroughly and place in a well ventilated, sunny position to grow on. The young seedlings grow fast and should be ready to be planted out after a year. Short cuttings from the tip of the branches can be made in autumn. Leucadendron argenteum plants, particularly young plants, are very susceptible to Phytophthora and it can wreak havoc in the nursery. The fungus enters the roots where they have been broken or damaged. At Kirstenbosch, the seedlings are often transplanted directly from seedbeds in the nursery into open ground and not grown in bags in the nursery, with good results. Plants in pots or bags should be planted out or potted up into bigger bags before the roots grow through to prevent damaging the roots. When growing silver trees, remember that they are very sensitive to any root disturbance and do not dig around their base or inside their drip line. Unfortunately once it is noticed that a tree is infected, the roots will already have been badly damaged and it is too late to save the tree. It is thus best to practice preventative measures. It is a waste of time, and a tree, to transplant an established tree. Williams, I.J.M. 1972. A Revision of the Genus Leucadendron (Proteaceae). Contributions from the Bolus Herbarium No. 3. The Bolus Herbarium, University of Cape Town. Rebelo, Tony. 2001. Proteas, A Field Guide to the Proteas of Southern Africa, 2nd Edition. Fernwood Press, Cape Town. Vogts, Marie. 1982. South Africa 's Proteaceae, Know them and grow them. Struik Publishers, Cape Town. Rebelo et al. manuscript version Dec 2006. African Proteaceae Red Data List. to be submitted to Strelitzia. Leistner, O.A. (ed.). 2000. Seeds plants of southern Africa : families and genera. Strelitzia 10. National Botanical Institute, Pretoria.